Former UFC heavyweight champion Brock Lesnar pauses for a photo after ruling out a return to mixed martial arts, as he announced he had re-signed with WWE on ESPN. Tuesday evening, WWE World Heavyweight Champion, Brock Lesnar, revealed to the world that he has signed a new contract with WWE. The announcement came as part of an interview with Michelle Beadle on ESPN’s SportsCenter. The contract, which will keep Lesnar with WWE for at least the next couple of years, brings a new angle to the WrestleMania main event this coming Sunday. With Roman Reigns being a heavy favorite to beat Lesnar, this added layer -- a real-life layer -- casts doubt on whether Lesnar will actually lose the title, which he has held since August 17 of last year, on Sunday night. "It was a hard decision to make. ... I thought about this for a year. And at the end of the day, it’s all about me wanting to have fun." “It was a very hard decision for me," the 37-year-old Lesnar said. "I’m at a stage in my career where I want to – it was just hard. It was hard for me. And it’s hard to talk about it. But the fighter inside of me wants to compete. The father, the husband – you know, I’m an older caveman now, so I make wiser caveman decisions. 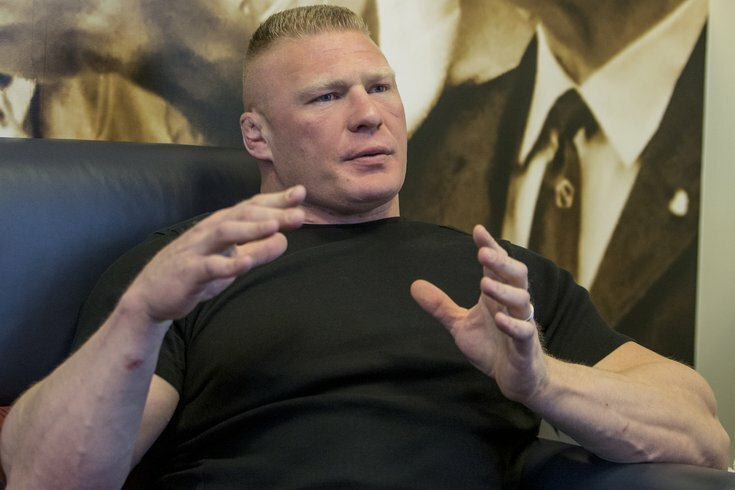 While Lesnar's days fighting in eight-sided polygons are finished, he wanted to make sure fans know his time ruling the squared circle are far from over. Both WWE owner Vince McMahon and Executive Vice President of Talent, Live Events and Creative, Triple H, took to Twitter to celebrate the signing. Lesnar re-joined WWE in 2012 after leaving the company in 2004 to pursue an NFL career, which ultimately failed. He then entered the octagon for UFC and captured their heavyweight championship in 2008 before defeating Frank Mir to become the undisputed champion in July 2009. After a severe case of diverticulitis, Lesnar lost two of his final three fights in UFC before re-signing with WWE. There was real temptation to return to the world of mixed martial arts, but according to Lesnar, WWE is where he belongs. "It was a hard decision to make," Lesnar told Beadle. "It took me a year. I thought about this for a year. And at the end of the day, it’s all about me wanting to have fun. And the money is great, but the lifestyle – for me to get back into the octagon and for the last two and a half months, I’ve been training to get back into the octagon, and felt physically great – but something lacked mentally. And that’s not good. This will be his third contract with WWE since 2012, as he signed a two-year extension before WrestleMania 29.